Herban Planet, LLC Jul 14, 2016 Cannabis, or weed, is basically just two main branches - Indica and Sativa. Both of them differ a lot from each other, although not as much from looks but more from the type of high they induce. Cannabis, or weed, is basically just two main branches - Indica and Sativa. Both of them differ a lot from each other, although not as much from looks but more from the type of high they induce. Each has a different characteristic nature and every man who used Cannabis has a specific taste because of these two. Cannabis Sativa being older than Indica’s discovery is slightly more popular, and grows in similar temperate to hot climates which are more easily accessable. Indica however, thrives in high altitude cold climatic regions in the south east such as Turkey and Afghanistan. - Sativa plants are typically tall and thin and can grow upwards of 20 feet tall. Indicas are short and bushy, reaching a growing height of only 2 to 4 feet. - Sativas grow long branches and sprout narrow leaves that are typically light green in color. Indicas have fewer, shorter branches with wide leaves that are darker in color. - Sativas take longer to mature and are usually harvested between 10 to 16 weeks. Indicas mature in a shorter time span and are generally harvested between 6 to 8 weeks. But the true unique difference is only noticeable in their effects. On one hand, Sativa is all about getting the body pumped up. It has a very noticeable energized, cerebral high – This is sometimes brilliant as it is uplifting and makes you energetic immediately; making it great for house work or exercise. It might also be hallucinogenic and spacey because of its cerebral nature, and hence is best suited for day use. 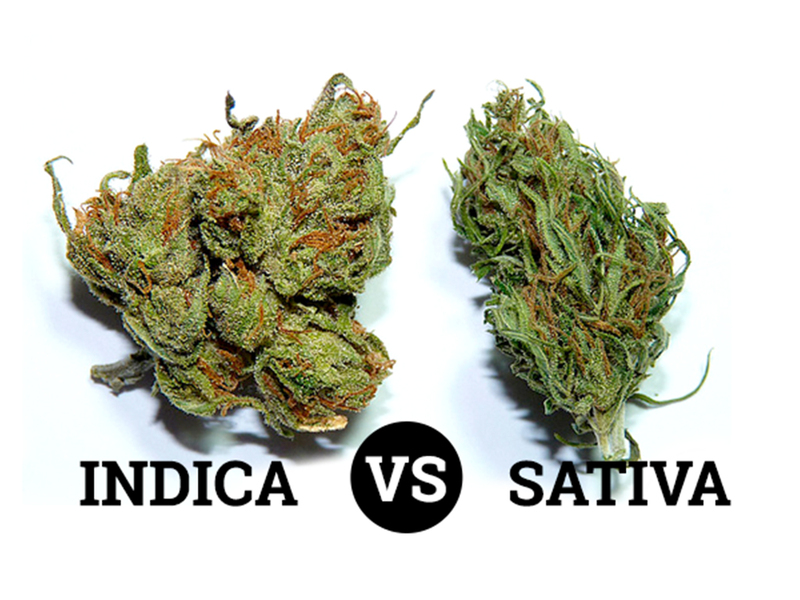 Indica is the black to the Sativa’s white. It has a completely different and more easing effect rather than maiking you energetic. It has an amazingly sedating and relaxing, full-body high – This makes them perfect for night use as they provide a certain body buzz. Indica strains are known for their “couch-lock” body effect that is well suited for nighttime because all you want to do is just settle down and dream all your stresses off. Therefore, Indicas are more likely used to relieve stress and aid with relieving sleep. Different in flavor as well, Indica is more of a sweeter strain such as a strawberry. Sativa is almost tasteless compared to Indica, being earthy and hard like a pine. But no matter the taste, both of them are fairly good at relieving symptoms. For Anxiety – Indica helps. For fatigue – Sativa does. For Insomnia – again Indica to the rescue… and so forth. So which type of Cannabis do you prefer? I’m sure after reading the above mentioned info you’ll be definite on the type of strain you need for yourself and which one you’d rather not have for some occasions.